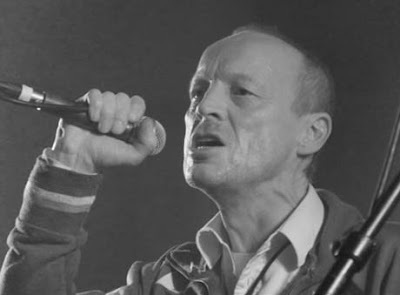 We report with great sadness the death of Larry Cassidy, singer and bassist with cult Factory Records post-punk group Section 25. Larry was found at his home in Blackpool on Saturday 27 February, and though the cause of death has not yet been confirmed there appear to be no suspicious circumstances. Born in Blackpool in April 1953, Lawrence John Cassidy decided against joining his father’s family business (Casdon Toys) and opted instead to study art in London, gaining a first class degree in 1977. Inspired by psychedelia and Krautrock, and by exposure to punk at the Roxy club, Larry decided to form a band back home, recruiting younger brother Vin on drums, and guitarist Paul Wiggin. The name Section 25 referred to a clause in the Mental Health Act allowing for involuntary detention. Thanks to early mentors Joy Division the group joined Factory Records in 1979, recording their first single (Fac 18) with Ian Curtis and Rob Gretton producing. Saville also designed the cover of From the Hip, their third album from 1984. Co-produced by Bernard Sumner of New Order, From the Hip saw a successful transition from abrasive post-punk to smooth electronics, best heard on the proto-techno club single Looking From a Hilltop. By now Larry’s glamorous young wife Jenny had joined the band, Tony Wilson having failed to interest a pre-Smiths Johnny Marr from taking over on guitar following the departure of Wiggin. Section 25 effectively split in 1986, Larry afterwards running a light industrial unit, and retraining as a schoolteacher. Plans to reform the group were upset by the tragic loss of Jenny Cassidy to cancer in November 2004, naturally also a devastating personal event for Larry, but three years later Section 25 released a new album, Part-Primitiv, followed by Nature + Degree in 2009. The Guardian also listed From the Hip as one of ‘1000 albums to hear before you die’. As appreciation of Section 25 and Factory continued to increase, the group again found themselves in demand as a live attraction, visiting Germany, Italy and the United States in 2009, and joined by Larry and Jenny’s daughter Beth Cassidy on vocals and keyboards. Larry played what proved to be his last show with Section 25 at the historic Plan K venue in Brussels on 12 December 2009, along with fellow Factory pioneers A Certain Ratio, Biting Tongues, The Names and The Wake. At the time of his death a remix album, Retrofit, was almost complete. Larry leaves a partner, Lesley, and two children, Nathaniel and Bethany.